Taking down a gunship. Of course. Yes, I know. It’s the same damn game again. Or is it? This time it’s the C64 version which has a great soundtrack and less slowdown than the Speccy one, but the sprites are much less impressive. The level layouts are, again, much the same, and all the bosses are represented even if the final boss was a complete walkover. He’s electric. He’s got a family full of eccentrics. I actually had to complete the game twice, because the first time I struggled to take screenshots (there’s no quick way in VICE on the Raspberry Pi) and so I used a cheat mode for the second run-through in order to get some – hence my bullet counter remaining at 500 the entire time. This had the bizarre side-effect of trying to skip a level every time I pressed down, so I actually had to play through it again as I missed stuff. The things I do for my single reader. Sigh. The post Midnight Resistance (C64): COMPLETED! appeared first on deKay's Gaming Diary. 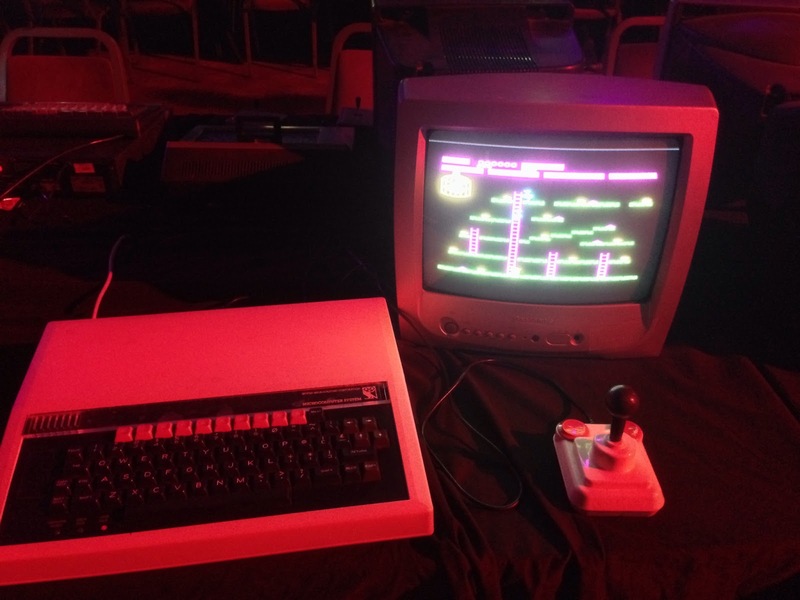 This weekend I went to PLAY Margate, a games exhibition which is the little brother to equivalents in Manchester and Blackpool. It was great; many different types of games all set up to be played with, random competitions, themed areas, and stalls selling stuff. Obviously I didn't buy anything - cough - but I played plenty. A game I've never given enough time to, but will certainly be doing so in the near future. I started from the very beginning and realised that without graph paper I wasn't going to make a dent on the game. I've always found it overrated, but that might be because I didn't play it at the time and only experience it after being used to the platforming on consoles. Fixed jumping paths and overly tight timing isn't a huge amount of fun. 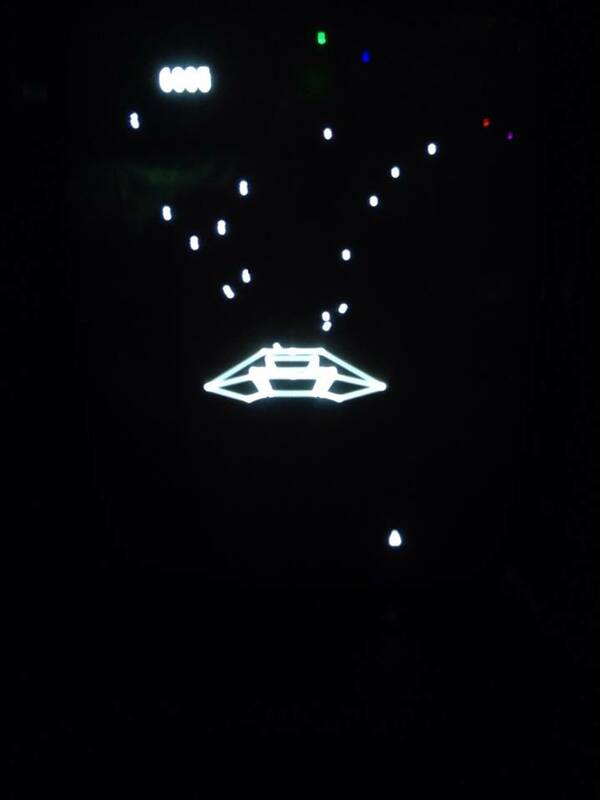 I've never played on a Vectrex, and was very pleasantly surprised with this. Graphically it looks fantastic, and the way the game expands on the Asteroids template by introducing enemies that move towards you, fire back, or move quickly around the screen. The controls were very tight indeed, and I managed to reach the fourth level before losing my first - and indeed my last - life. They had a competition for the best time around a certain circuit. I only managed to get within 5 seconds of the winning time - I need more practice! Talking of competitions, there was a more formal competition where you had to record high scores for three different games. Hang On was the first; I'd been playing the 3DS version a few days before so thought I would do OK but the Master System game just felt all wrong and as a result my scores weren't great. I still got 28th highest score of the weekend, though! Kung Fu Master was the second game, which I did rather better on despite never having played before - 6th highest of the weekend, and setting a high score on the machine I was using. It's a relatively simplistic game, but I quickly worked out that punching an enemy gives 200 points while kicking gives only 100 - so I was able to work through levels building up points quickly. Again, I'd never played this but quickly got the idea. Challenge mode sees you working on two sides of the screen simultaneously, firing balloons upwards to form groups of three or more. It took a little while but I soon worked out how to set up combos, which gave many more points and extended my playtime. In the end I came 8th on the leaderboards. I played through the Green Hill Zone mainly to amuse a couple of toddlers who were watching, managing to get through without dying. 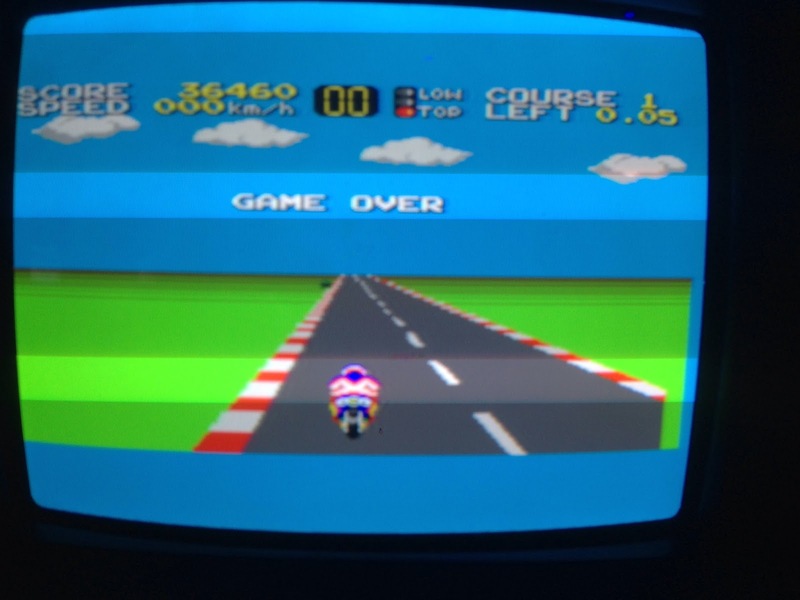 Some people say that this game is better than the Mega Drive games; they are wrong. It's still good though. 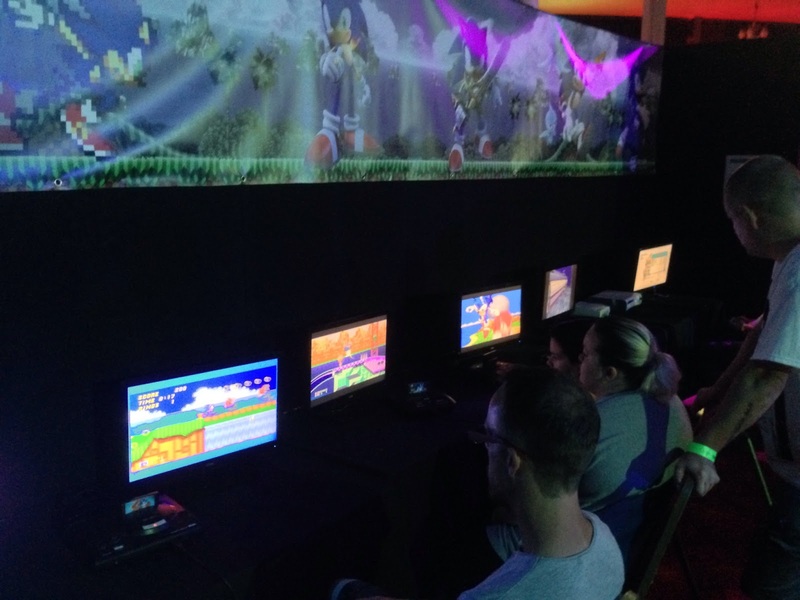 As part of the same display as the MS game, they had Sonic 2, Sonic & Knuckles, Sonic Adventure, Sonic and the Secret Rings, and Sonic Generations - representing the evolution of Sonic. It's quite telling that the later games - other than Generations - were being less played. I had a quick blast through the Sandopolis Zone, which is where the previous player had left off, and was reminded how much fun it was. I may need to go and play the Xbox 360 versions some more. Similar to Sonic, there was a display showing the evolution of Street Fighter. They didn't have a version of the original game on display, starting with SFII on the SNES, but I chose to try Alpha, a game I've not played before. Initially I tried to play as Final Fight's Guy, before realising I didn't know any of his special moves and losing in the second fight. I then tried Ken, and fought through four fights, before losing when the computer used the special gauge which is something I've never quite worked out. A hilarious rip-off on Donkey Kong, which basically changed the layout of some of the levels and made everything brown. That latter bit may have been the C64 though. A couple of games against three random opponents in the multiplayer arena. I won two and lost one, which felt like an achievement given that I had no idea of the courses before racing. I'm not sure I've played this before, actually - it was more complex than I was expecting. I'm sure I've played something very similar but without the humans to rescue, and given that that is a central mechanic, it must have been a different game. Anyway, I played through a few levels of this before dying. I got an A licence! Mainly because I did a drift into a wall and sat there racking up points for 30 seconds, half way through my run. It's amazing how much of the map I can remember, and despite the joypad having seen better days I managed a few limit cuts on the way down the hill. The music in the hall was too loud to be able to play this properly (or Donkey Konga, which kept hearing the clap sounds constantly), but I can't understand why they were showing the worst version of this. Why not the arcade game, or the Dreamcast version? And why has this never been released for Playstation Move? A few minutes of exploring Venice, which took me back to the Christmas when I got my Playstation. I still prefer TRII to the first game, even if the rest of the world is the other way around. I still prefer later games to this. 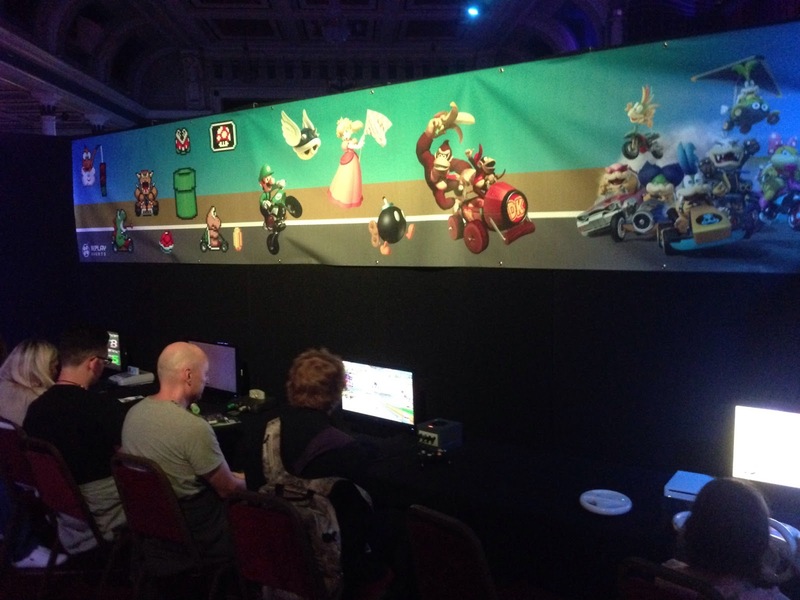 Mario Kart 8 is just so much better. They actually had quite a few of these in a display, but I've played the others to death and have them all at home anyway. 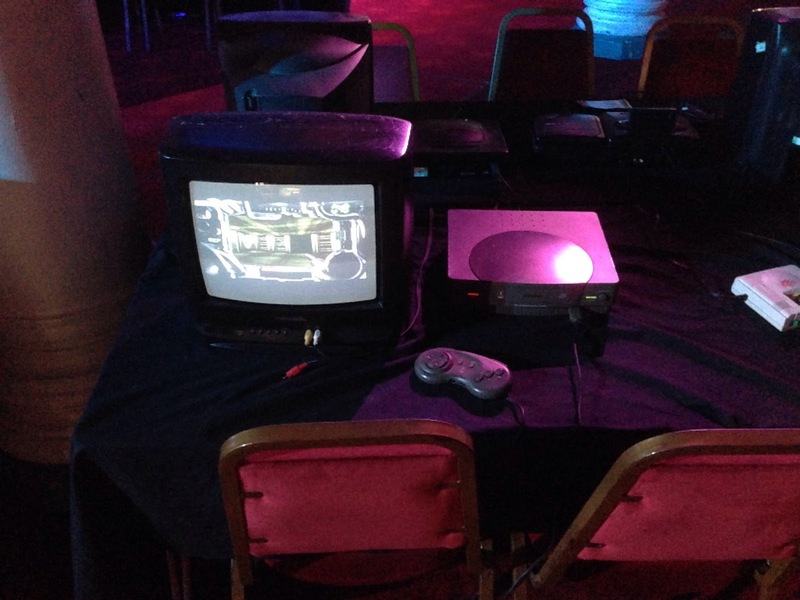 An illustration of how far first person shooters have become. I have no idea what this game was, and searching for screenshots has turned up nothing. It was just a bit dull. A game against a random man. We were both hopeless and unable to control the bat. And another game I was hopeless at, having lost my ability to control with a paddle wheel. After losing the first game very quickly, I lasted a bit longer on my second attempt and even got onto the high score table. The last position, but still.